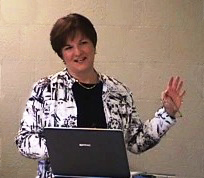 Welcome to the website for Janice Cairns, speaker, trainer, and management consultant. Drawing on her successful career in sales and management, Janice helps companies and individuals improve their effectiveness through professional development and skills training. Janice offers skills development workshops and training sessions that are designed to engage participants and create positive change. Learn more about Janice, and about the workshops and services that she offers, on the following pages. Janice Cairns is a management consultant and educator specializing in professional development and customer relations. She began her career in a sales position with a national corporation. After many successful years in sales and management with both large corporations and small companies, Janice established her own consultancy to help the individuals in a business come together to build an engaging and effective culture. Janice is an enthusiastic and entertaining speaker and a devoted problem-solver. In one of her best-received workshops, presenter Janice Cairns gently guides participants to identify our unique procrastination stumbling blocks, and shows us how to release the barriers to achieving our own goals and meeting our responsibilities. No stranger to the procrastination struggle, Janice believes that it takes someone who has successfully fought procrastination to truly help a procrastinator. No hard-driving "Do It Now" lecturer is going to inspire lasting change in a person prone to putting things off. This updated version of "Conquering Procrastination" incorporates the latest exciting discoveries from neuroscience. Participants learn how their brain reinforces the procrastination habit, how it responds to change, and how it establishes lasting change. You may use the form at right to send a message, or contact us at the address below. Copyright ©2011 Janice Cairns. All Rights Reserved.